The Nokia N97 probably needs no introduction to our readers, it's a powerful touchscreen device with a slide out QWERTY keyboard. Unfortunately, it's also quite a bulky device - which is presumably the inspiration for the Nokia N97 Mini. 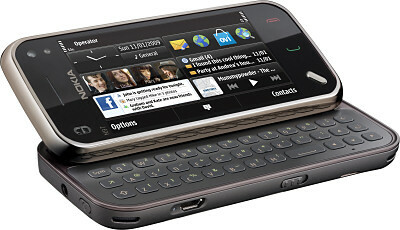 The basic external differences between the Mini and the original N97 are that the Mini has a smaller screen and no navigation pad on the keyboard. This means that the Mini weighs 138 grams compared to 150 grams with the N97, and the "footprint" is about 9% smaller than the N97 as the Mini measures 113 x 52.5 x 14.2mm. Despite being smaller, the display is still a 640 x 360 pixel touchscreen panel, measuring 3.2" diagonally. This is certainly good enough more most web browsing and multimedia applications. It's not just on the outside that the Mini has been shrunk down. The amount of internal Flash memory is down to 8GB from the whopping 32GB in the N97, although this should be plenty for most people and it can be expanded using a microSD card. The battery is also smaller, a 1200 mAh battery rather than the 1500 mAh cell in the N97, and this does shorten the talktime to 4 hours on 3G. On the back is a 5 megapixel camera with a Carl Zeiss lens and dual LED flash, capable of recording VGA resolution video at 30 frames per second. The N97 Mini also has A-GPS plus Ovi Maps for navigation, 3G and HSPDA high-speed data, WiFi, a 3.5mm audio socket, TV output and all the usual software features that you would find on the original N97. In other words, the Nokia N97 Mini is still a highly capable device despite the slightly cut-down features. There are some software updates available, and these mostly seem to be in the social networking category. This new version of the software can also be applied free-of-charge to existing N97 handsets, so both the Mini and N97 will have exactly the same software capabilities. When it comes to price, it's clear that Nokia have shrunk that down too. Nokia say that the N97 Mini should cost around €450 before tax and subsidy, compared to the €550 that the original N97 cost. However, the N97 has been around for a little while and can be had also for around €450 before tax if you shop around. Given that there won't be much difference in price, and the fact that the Mini is only about 9% lighter and smaller than the original, is there really any point to this handset at all? Nokia say that the N97 Mini should start shipping in October 2009.